Enlarging or reducing plans to meet your modeling needs...How do I enlarge 1/72nd scale plans to 1/48th scale. Here is a simple explanation to making accurate conversions between scales. Calculating an enlargement or reduction percentage? Lets say you have a set of 1/72nd scale plans and your working with a 1/48th scale model and you want to enlarge the plans to 1/48th scale. This means when you use a copier to enlarge the drawings you would set it to 150%. The resulting copy will be 1/48th scale. This means when you use a copier to reduce the drawings you would set it to 66% of the original. Double Check Your Math...One way to check your math is if your converting to a scale larger than the plans then the percentage will always be larger than 100. If you are converting to a scale smaller than your plans then the percentage will always be smaller than 100. 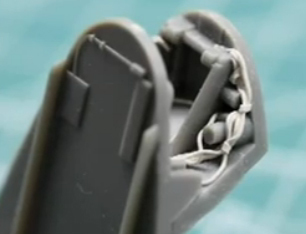 Looking at the great detail in some of the cast resin cockpits I always wondered how they made the bundles of wires and what kind of wire they used. Well here is the answer...MILLIPUT. Milliput is a two-part epoxy putty that can be sculted into many shapes and sizes using water. 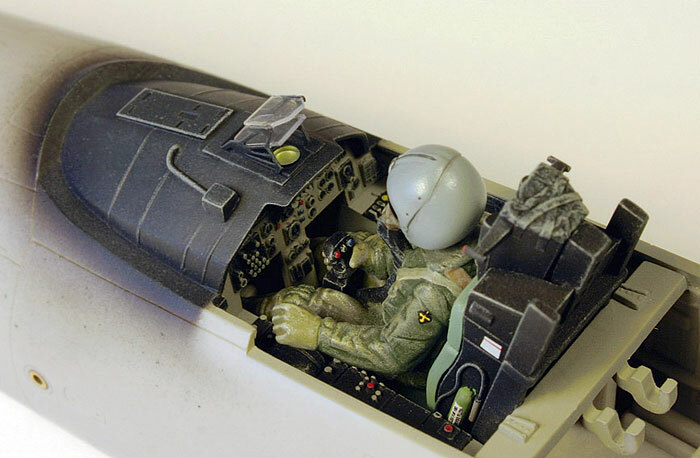 This is a terrific article I discovered on how to use Milliput to simulate wiring in cockpits of model aircraft from the Squadron Shop's website Tactics and Techniques for building scale models. Click Here and learn a great secret! Painting small parts individually either by brush or airbrush can be a real pain. Here are a few ideas to hold small parts securely while painting. A small hole was drilled through the bottom of each ammo can with a pin vise. A toothpick was firmly pressed in the hole. You may need to cut off the end of the toothpick so it fits securely. Because the end of the cocktail stick is tapered the size of the hole does not need to be exact and the toothpick will securely hold the part. There are many uses for left over plastic sprues. The tarp on the right has a hollow bottom. An ‘L’ or ‘T’ shaped piece of left over sprue is super glued into the hollow. When the tarp or pack has been painted and is dry the sprue can be cut off level with the bottom of the piece. Once I have painted the part I have a piece of shipping styrofoam handy so I can insert the toothpick or sprue until the part is dry. This works well for adding washes and drybrushing as well. Jar lids are another resource with many uses. Small items can be attached to a jar lid with small pieces of Blu-Tak or similar products designed to attach posters to walls. The parts will be held firmly in place for spraying or brush painting. Take care that the Blu-Tak does not squeeze out underneath the part and prevent part of bottom edge from being painted. It is advisable to remove the part as soon as possible because the longer it is left on the jar lid the more firmly 3-M’s Blu-Tak will grip on to it. When selecting a base you should take into consideration that it should complement and enhance your model. A base that is to large, to small or not proportioned when compared to the model can take away from the effective display of the model. With aircraft I tend to make the base smaller than the wingspan of the model. The base is representative of the environment the actual aircraft would be found when on the beach or in the water. You don’t have to finish every square inch of the base with the water. An old artist’s trick is to let the viewer perceive the edges of the environment in which the subject is placed. One rule to always remember is never place your model parallel to the edge of your base (see figure above). The base itself can be made of hardwood, particleboard or just about any product as long as it has been sealed. The products used to create the water are all acrylic and water soluble so be sure and seal the base so it does not warp from moisture. If I’m using a frame-type base I will use a piece of Styrofoam for the center of the base. In the case of the Zero floatplane it was very simple to hollow out the area where the main float sets. Just hollow out the foam until you can place the model at the correct angle. The foam base does not have to be a tight fit as the model will be anchored to the base with the artists gel and it will fill the slight gaps. If you are using a solid base you will have to trim the pontoon or ships hull to achieve the proper angle. I prefer to use the foam because it eliminates the need to do surgery on your model. Before I position the model and apply the artists gel I paint the water and any land areas the appropriate colors. I use regular artist’s acrylic paints for this process. I will blend various colors to achieve a look of depth and transparency when the model is along a shoreline. For ocean-going ships I paint the base the appropriate shade for the ocean depending on the location of the model. For instance, the Pacific Ocean tends to be more blue, the Atlantic blue-green and the north Atlantic grayer in color. Study color photos and you can pick out the difference. Once the base has been painted it is time to positioned the model and anchor it in place using the clear artist’s gel. Liberally coat the section where the model will set with artists gel. Then, set the model in position. The artist’s gel is thick and you can use it to form small waves or patterns on the water. Once you have the model anchored you can continue to cover the base with the gel. The gel goes on white but will dry to a clear finish. For the finishing touch I go back to the Acrylic artist’s paints and add white for the wave tips and blend the colors into the surrounding water. Now you will think this looks strange because the artist’s colors are drying to a flat finish. But to finish the base you just add another layer of acrylic gel and it not only ads depth but gives the entire surface a gloss appearance. This is a relatively easy process that produces great water effects. It takes very little time to complete; the Zero floatplane was finished in one evening. With a little practice anyone can reproduce this effect. What do you do with your collection of after-market decals and leftover kit decals? Here is an idea I discovered and it has worked extremely well. I have found the best way to keep left over decals safe from fading and humidity is to store them in a sealed Rubbermaid storage container. I toss my leftover decals in the container along with a small silica package that comes with many electrical products and cameras. The small packet absorbs any moisture and the container helps seal out humidity. To store my collection of after-market decals I use a 5 3/4 x 8 1/2 binder and vinyl sleeves or 9 x 12 binder with 8 ½ x 11 sleeves. I remove the decals and instructions from their package and place them in a clear vinyl picture sleeves. They are arranged by aircraft type according to the name. For instance, all my P-47 decals are placed together followed by P-51 sheets. National insignias, stripes and block letters are kept in a separate binder. The vinyl sleeves keep the decals organized and protect them from moisture. I have decals that have been stored this way for over 15-years and they still look brand new. You can purchase the Rubbermaid containers at any Wal-mart, Target or Kmart for between $2.00 and $4.00. The binders and vinyl sleeves can be bought or ordered from Office Depot, Staples or Office Max. The cost is approximately .30-.35 cents per sheet for the small sheets and slightly more for the large sheets. There’s nothing worse than applying the final coat of clear flat on your model and discovering some of the decals have that pesky silvering showing through. What causes this phenomenon and how can you eliminate it? The phenomenon of decal silvering is cause by light refracting between the painted model surface and bottom of the clear decal film. This primarily happens on a flat painted surface. Unfortunately, most aircraft and armor models have a flat or semi-flat finish. 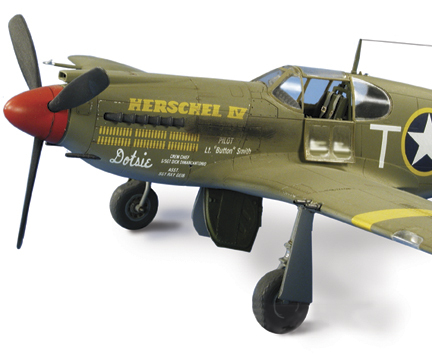 Many modelers give their flat camouflaged model a coat of gloss before applying the decals to ensure there would be no silvering. The problem with this process being you have painted a model with flat paints to achieve an accurate look and now you are applying a gloss coat…so much for the flat finish. Once the decals are applied and dry, you guessed it, you have to add another flat coat to get rid of the gloss finish. Seems to me like you are taking one step forward and two back. So, how can you keep the decals from silvering on a model with a flat finish and eliminate the extra work required to glosscoat the model? To eradicate the problem you have to understand the cause. 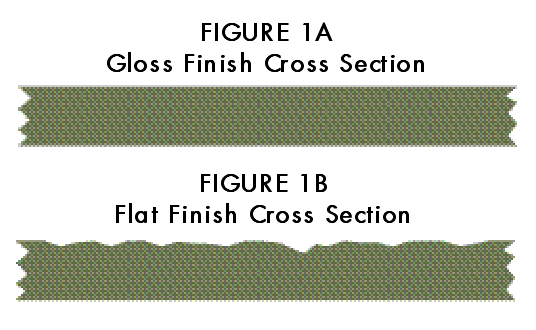 If you look at a microscopic cross section of a model with a gloss finish you will see it appears perfectly smooth [Figure 1A]. However, look at a microscopic cross section of a model surface with a flat finish and you will see a pebbly uneven surface [Figure 1B]. The problem is the microscopic uneven surface of a flat finish. 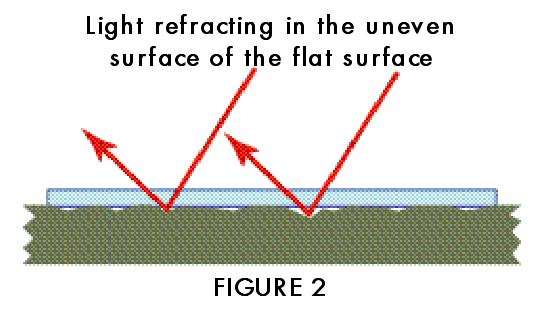 Once the decal is placed on the model, small pockets of air are trapped and allow light to refract causing the silvering [Figure 2]. So, to solve the problem you must apply a decal to a gloss surface. 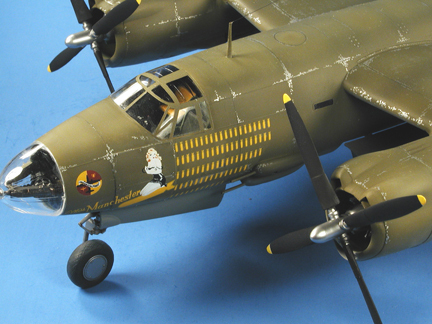 Many modelers used the tried and true method of spraying a gloss finish over the entire model. They apply the decals using setting solution if necessary and when everything is dry the model is over-sprayed with the appropriate finish of gloss, semi flat or flat. It works extremely well but requires extra time for the gloss finish to cure before applying the decals. I didn’t like adding an additional coat of paint to my model or the time required to apply and let dry. After several unsuccessful and time consuming attempts to eliminate decal silvering, Marv Howell, a veteran modeler and Fort Crook member showed me this trick and I have been using it ever since. This decal application process requires very little extra effort and virtually eliminates silvering. You will need Q-tips, white glue, a setting solution (I prefer Solv-a-set) and a soft cotton cloth. After wetting your decal and waiting for the glue to dissolve and mix white glue and water with a brush. This mixture should be thin enough to easily brush on the model where the decal will be applied but thick enough to thoroughly coat the area. With the white glue and water solution applied just place the decal in position and with a Q-tip gently roll the decal working from the center out. 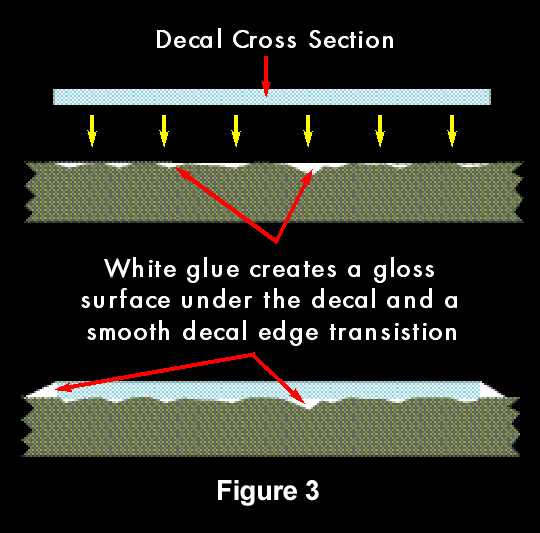 This will force the excess white glue and water mixture from under the decal while still filling the microscopic valleys of the flat paint surface [Figure 3]. 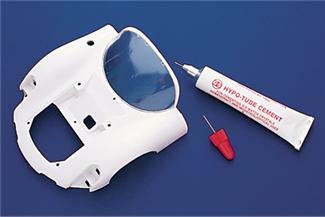 The effect is the white glue effectively provides a gloss finish under the decal. It also provides a smooth transition between the edge of the decal and the surface of the model. This is especially effective when using decals that are relatively thick when compared to today’s standards. Once the decal is in place and rolled with a Q-tip I apply the setting solution, which ensures the decal snuggles down into recessed panel lines and conforms to the surface. On difficult sections I sometimes roll the decal with a Q-tip immediately after applying the setting solution to help the decal settle in place. A word of caution however—you must perform this last step as soon as possible after applying the setting solution. Waiting to long can cause the decal to distort as the Q-tip is rolled across the surface. Once the decals have dried I take a damp soft cloth and remove any excess glue or water spots and the model is ready to apply the final finish coat of clear effectively sealing the decals, providing a uniform finish. This is an easy process and eliminates the need to apply a gloss coat to a model prior to decaling. I’ve successfully used it on flat black finishes, which are probably the most difficult color to eliminate decal silvering. Try this process on some painted test samples and get a feel for it before you try it on a finished model. You’ll be surprised how well it works. Here is a handy technique for producing the non-skid surfaces seen on many modern tanks and AFVs. You will need your favorite primer (either using your airbrush or a spray can), masking tape, a hobby knife and good reference material. The first step is to determine the areas which will receive the coating then carefully tape-off the areas that will not receive the coating. You can do this using tape or if there are uneven areas you could use a liquid mask. Once you have completed this tedious task you are ready to start apply the textured surface coating. You will get the best results by misting a coat of primer over the designated areas holding your airbrush about 15 to 20 inches directly over the model while spraying at about 40 psi. The primer will start to dry over the 15 to 20 inch distance creating a rough orange peel affect. I use Tamiya Mr. Surfacer 500 modeling primer straight from the jar and spray it through my Iwata Eclipse airbrush. You will need to clean your airbrush immediately or it will clog. I understand using spray cans of Mr. Surfacer will also work. It took some time experimenting to get the combination of the right air pressure, paint consistency and spraying distance to gain the desired effect so take your time and practice on some spare parts. With a little practice you will be able to replicate the textured surface you desire. Be careful when spraying on your final colors. Applying a one heavy of coat of your final paint color could start to disolve the Mr. Surfacer. It is a good idea to let your non-skid surface dry for 24-hours and then apply several light coats rather than one heavy coat of your final color. Photo-etch adds a crispness of detail that plastic - by virtue of the way plastic is molded – cannot replicate. Just look at how crisp, sharp and clean the Eduard Photo Etch set of this 1/72nd scale Bf-109E looks when compared to the thickness of some of the plastic surrounding it. Sometimes molded plastic just cannot compete with the crispness of the brass edges especially in smaller scales. Photo-etch can improve your model to no end and shouldn’t be shied away from however daunting it may look for the first time. Typically, photo-etch comes in “Frets” as opposed to the “Sprues” of the plastic world. It can come in two types of material, brass (the most common) or a steel alloy but there’s no appreciable difference between their workability. Always try to keep the photo-etch fret flat when cutting away the pieces you want, avoid doing so on a cutting mat. Cutting mats are designed to be soft and you run the risk of bending or warping the fret. Use a sharp #11 X-acto knife to cut the pieces away on an old piece of a glass or an acrylic cutting board. Photo-etch parts will dull the blade quickly so it's best to have replacement blades ready to go. Sometimes sharp, small cuticle scissors work better for cutting the bits away from the fret minimizing the amount of touch-up work later. However, be sure to hold a thumb or finger over the part you’re cutting away from the fret - unless you enjoy searching the carpet or floor on your hands and knees just after you’ve seen a piece ping off into the void below your desk. Creating 90 degree bends can be done simply with a steel-ruler and a single-edge razor blade but more complex bends and shapes are best done with a photo-etch bending tool. There are many options and sizes available, from bending pliers to more complex and expensive bench-top bending jig. However, the prices vary greatly. Usually armor and model ship builders are more likely to own PE bending tools given the amount of Photo-etch available. Armor and model ship kits have been released with Photo-etch for some years but now, it seems, model aircraft manufacturers are beginning to cotton on to this photo-etch market. More and more kits are being released with Photo-etch included and it seems logical that an investment in a bending tool is becoming more and more advisable. When bending the PE into curves look for something around your modeling table which matches the diameter of the curve you want to create; such as a pen, small bottles or anything that’s solid and has the desired curve then use that as a pattern to shape the PE. 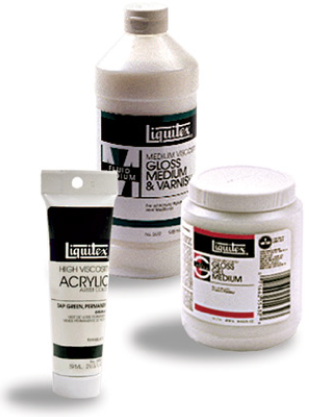 Super glue or Cyanoacrylate (CA): This is excellent for gluing PE to either plastic or to itself. It can come in various viscosities from a very thin type, which will "wick" through gaps by capillary action to the thicker viscosity gel like versions. It's also available with different setting times from the "instant" type to some which allow a short period of time before setting which gives a modeler time to adjust the placement of the part etc. If you are using the delayed setting type but want it to set immediately after application then a "kicker" or accelerant is available to spray on the joint which will set the pieced instantly. However, be careful and test the kicker on a test piece to ensure it does not attack the plastic. Super glue is wonderful BUT you really must avoid using it around the clear parts of your model. Almost everyone has seen CSI on TV? And you have seen how CA gives off fumes, which clings to fingerprints, Well, these fumes will attack and seriously damage the clear model parts such as canopies, viewing ports, windscreens etc. by fogging them with a white haze. Once that happens toss the part away and hope you have a spare or can order a replacement from the manufacturer. One solution when you must use super glue is to dip the clear parts in Future Acrylic wax, which seems to eliminate the problem with CA but you should always be careful. 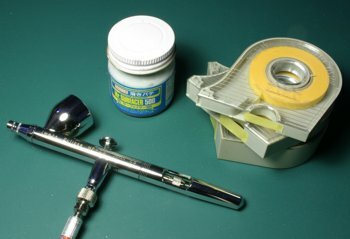 White Elmer’s Glue: If you are fixing PE to, say, an instrument panel or to cockpit sides or the windscreen of a truck then ordinary white glue will work. It sets clear and allows you a little more time to adjust the placement of the part. It’s also easy to remove the part if necessary and best of all - it gives off no fumes to ruin your clear parts. Watch Crystal Cement: One last way to attach photo-etched pieces to clear parts is to use watch crystal cement. Jewelers mainly use this type of glue to attach the clear crystal faces onto wristwatches. It dries crystal clear and is slightly flexible before curing. It sets in 15 minutes and excess uncured cement can be wiped away with ordinary denatured alcohol. You can find it at Micro-Mark on the web. At first glance, Photo Etch looks intimidating but with a little time and patience the average modeler can master this modeling task adding detail to a model that cannot be replicated in plastic. 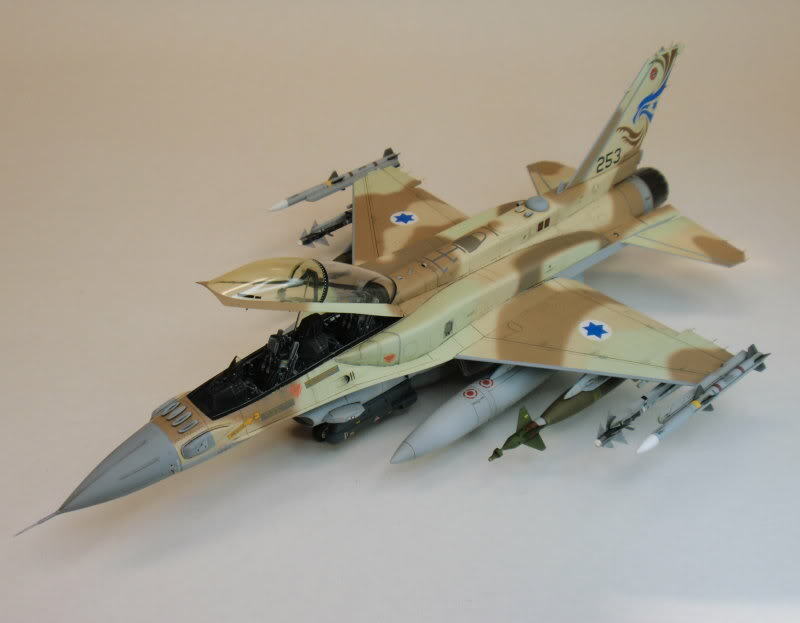 One method to make soft edge camouflage like on the F-16I above is to use Loctite Fun-Tak. This product by Loctite is an very elastic, putty-like material, which you'll find in the painting section of your local home improvement store or office supply section at Walmart. Teachers stick this stuff in little chunks on the back of posters and drawings to temporarily mount them on the classroom wall. But for modelers it has a great use. I have found the slightly tacky quality of this material useful for creating soft-edge camo demarcation lines. Roll it out in small pieces the about the size and shape of a stirring straw. It can then be lightly pressed onto the surface of your model along your proposed color demarcation line. Fill in any areas you don't want painted with a liquid mask or tape, then spray your color. When you remove the Blu-tac and the masking tape, you'll find a nice soft edge with very minimal overspray. Working with the clear parts of a plastic model aircraft or vehicle can be very frustrating at times. Scratches, glue fogging and paint over spray are just some of the problems you can encounter with that aircraft canopy or car windshield piece. 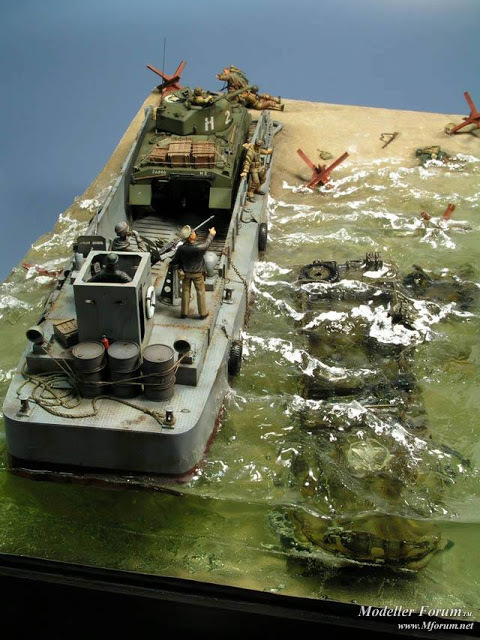 Here are a few tips for working with the clear plastic pieces of any scale model kit. Attaching a canopy or clear piece: White glue is the usual method for simply attaching the clear piece to the rest of the model. It doesn’t mar the clear plastic and it will dry clear. It is also water soluble so a damp towel can wipe up excess before it dries. You can get this glue anywhere. Lots of detail sets in photo-etched metal are available to detail canopies and windshields. So now the problem becomes gluing metal to the inside of a clear piece without marring or fogging. Here the recommendation is watch crystal cement. This cement dries clear and is slightly flexible. It’s mainly used by jewelers to cement the clear crystal faces on wristwatches. This glue is harder to obtain, but you should be able to find it at a jeweler’s supply house or Website. Fixing Scratches: First, get some “wet and dry” sandpaper in a variety of grades from medium to super fine. Start with about 600 grade and gently sand the piece progressively using finer grades (800, 1000, 1200, 2000). The sheets are available in super fine grits at your favorite hobby shop or craft store. Remember to keep the area you are sanding lubricated with water so the debris does not scratch further, ideally do the sanding under a running water tap. Continue this process until you cannot see any scratches when you dry the part. Next the clear piece will need to be polished with a high quality plastic or metal polish. I like Blue Magic or Novus but there are several brands you can choose from. Apply and polish using a soft clean cotton cloth like a white t-shirt. Polish until you get a nice shine. Coating the Clear Piece: Finally to enhance and protect the gloss piece it can be coated with clear acrylic floor polish (Future). Wash and dry your clear part and dip it in the floor polish and allow the polish to coat the plastic piece. Lightly touch the corner of a paper towel to any excess polish and it will draw it off. Let it dry undisturbed on a clean surface. The clear floor polish will flow into any finite scratches left from the sanding and polishing. 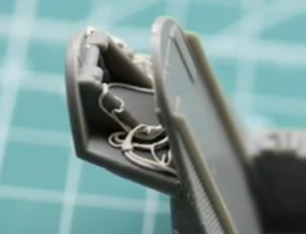 It will also keep the clear piece from fogging when used with super glue. 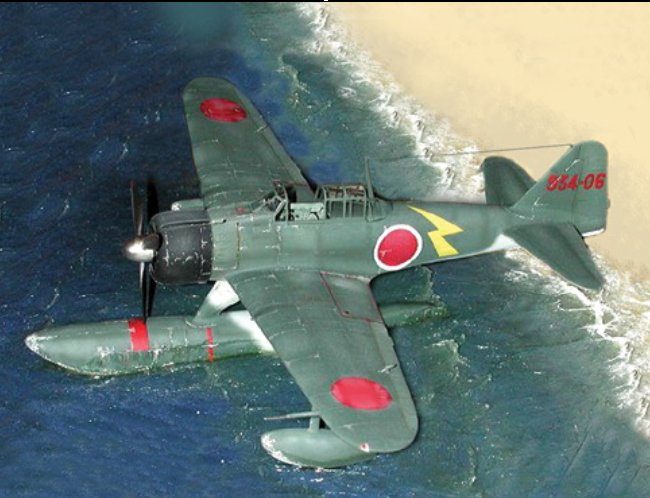 Among the many painting techniques, dry brushing is a great method for creating a realistic scale model airplane. This is especially true for the cockpit, as it brings out detail that might otherwise go unnoticed. You will need paint and a good quality paintbrush. I dry brush almost all the plastic model co ckpits using Flat White, Light Gray and/or Silver in enamel or similar colors using artist's oil paints.Dip your brush into the bottle and then remove about 95% of the paint using tissue. You may also choose to wipe off any excess paint by brushing over a scrap piece of paper. Careful! If you apply too much paint to the cockpit, the entire cockpit area may have to be re-painted to the original colour. The idea is to have a minimal amount of paint on the brush, in other words, a "dry brush". 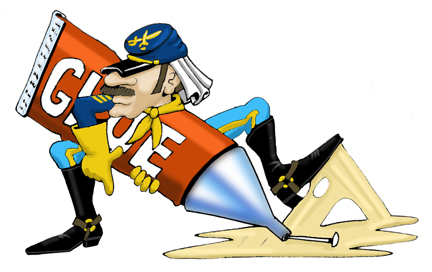 Apply the paint using a back and forth motion and with minimal brush pressure. Concentrate on areas of the scale model airplane that you believe are most adequate. This may include the instrumental panels, sidewalls, levers, buttons and surface edges. The idea is to graze the plastic model surface with your brush, so that only raised areas catch the paint. Like many other painting techniques, this requires a lot of time and patience. Your goal is to add depth around dark areas of the cockpit as well as the raised details of the surfaces. Practice these steps and enjoy the effects. 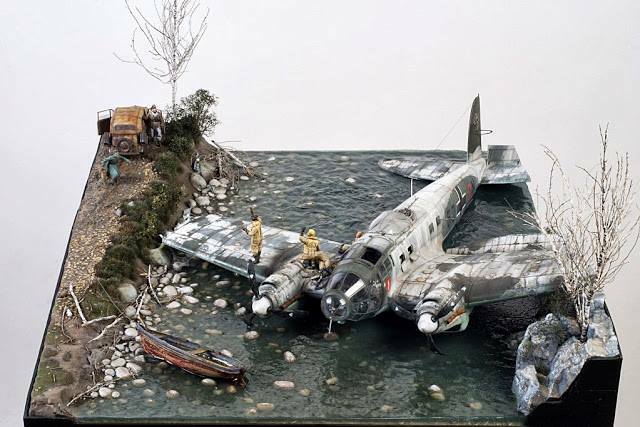 A diorama, in my opinion, can be one of the hardest pieces for a modeler to work on. One must put a lot of effort and resources into building a scene, and of course, the larger the base typically the more complex it is. This is probably one of the reasons I don't see very many of them on show room floors. There are a lot of things the modeler has to get right in order to produce a successful diorama, and I've compiled a few of them into a short list. Let's see if you agree with me. Unless your scene takes place within a ruined city-scape, than avoiding the use of foliage is almost impossible. There are a wide range of resources available to recreate trees and bushes, grasses and flowers, and some are better than others. In my old days, I used to think a little static grass and lichen would suffice, but it’s fair to say I was just kidding myself back then. Smaller amounts of vegetation can be recreated quite easily with static grass or stiff brush bristles, but if you're looking for an acre or two of forest or jungle, it gets a little tougher. If you're going to include plants, they must look like plants. It’s at that point where investing in some aftermarket plants will come in handy; unless you want to painstakingly scratch build your own. Fredericus Rex and Kamizukuri are probably two of the best photo etch paper foliage manufacturers out there. They can help you. This is probably the easiest thing to do, but one of the most important. A diorama is a basically a snap shot of an event. Within that snap shot are the characters playing out the scene. Characters can be anything from armor to figures depending on what you're trying to depict. Arguably, it’s the models within the diorama that have to be the best represented. 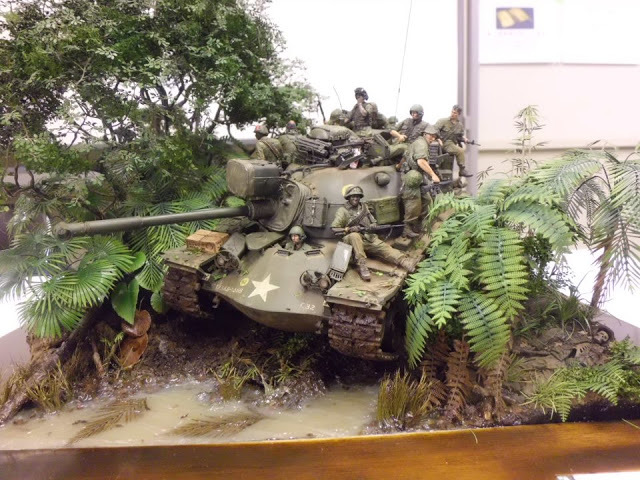 I can't say how many dioramas I've seen that have failed to capture my attention because the models fell short - exposed seams, silvering decals, etc. Having outstanding ground work marred by a mediocre tank will fall flat every time. It just won't look right. Like a child learning to walk, it’s best to crawl first. Nail the modeling basics first - construction, painting, weathering, etc. - before diving into a more complex diorama. Because everything in the scene must blend seamlessly. Each aspect must be given the same amount of attention. All the elements must flow from one character to the next. Whatever state the ground work is in must be transferred to the models in the diorama. If there is mud on the road, the tracks of the Sherman should be muddy. Conversely, there should be little mud if the tank is rolling through a grassy field. If water is a prominent feature, make sure items are wet that need to be so. Too many times I've seen vehicles look out of place because their state didn't match their environment. If you look at the pictures above, you'll see what I mean. Look how the dirt and mud of the jungle floor essentially goes all the way up to the troops themselves. Blending all the aspects together makes for a good diorama. All dioramas should have a clear story line of some kind. It can be simple, like the several you see above, but it has to be obvious. Getting the composition right is first and foremost important because you don't want viewers looking at all your hard work scratching their heads and wondering what the heck is going on here. Randomness just doesn't have its place in a diorama. You don't want to depict a dramatic battle scene and have one lone Panzer Grenadier standing to the side with his MG42 slung over his shoulder. That just wouldn't make much sense. Know your story before you build, and don't be afraid to amend a few things as you go. If you have a good story, be sure to tell it right. So, that's it. My top five list of things that can really make a diorama pop. I will say that I haven't nailed all of these aspects, but I'd like to think I'm improving. I believe that these are always my goals going in to a build, though some remain elusive (water), I'll just keep practicing until I can get them down.